Her royal highness travels in style on this personalized princess ornament! 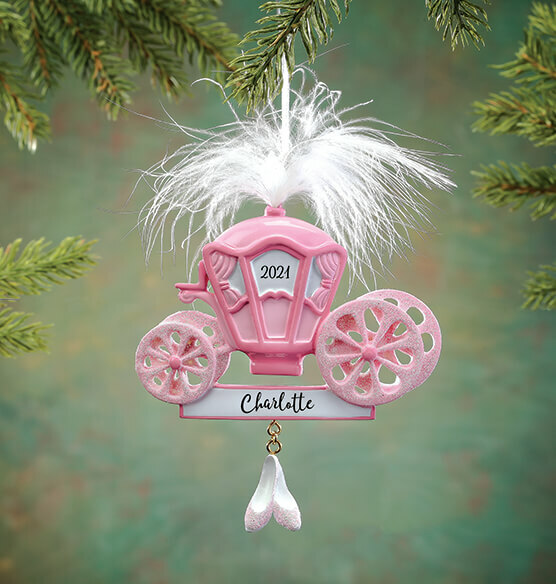 Our princess Christmas ornament features a fairy tale carriage with sparkly wheels, feathered top, and dainty slippers hanging below. Resin, with hanging ribbon. Personalized Christmas ornament measures 4 1/2" wide x 5 1/4" high. Specify name; limit 1 line, 8 letters/spaces. Specify year; limit 4 characters. We’ll personalize this keepsake ornament with year and name of your princess! An adorable gift that will bring back great memories. I purchased two - one for my daughter and one for a neighbor's child. Both children are in the princess/fairytale stage of toddlerhood. The ornament is sturdy but breakable - not a toy. The size is good also - not some tiny thin ornament. This thing is really cute!!!! Bought this ornament for my granddaughter who is really into princesses right now. She just loved it! Couldn't wait to hang it on the Christmas tree. My little niece will love this! Perfect for a little princess, :)! Love this ornament, great quality! Great for little girls that love the princesses. This will be a special ornament for my granddaughter for years to come. Unfortunately it is breakable so hopefully it will be carefully taken care of. Personalized ornament was spelled correctly [...] Very happy and would order again. Got two of these for our great granddaughters. They Are our Princesses. My granddaughter was very happy and the smile on her face was worth it. It was perfect and the quality was good. She hung it on her tree and kept showing everyone her ornament. Yearly I look for new and unique personalized ornaments for my grandchildren. This is a high quality, reasonably priced ornament that will last throughout the years. It is a keepsake my granddaughter will have for all times. Perfect for a 'pink princess'! Our five grandchildren look forward each year to their personalized ornaments, chosen to compliment their personal interests for the year. The pink fuzzy carriage was perfect for our 'pink princess' granddaughter this year. Bought this for my grand niece for her first Christmas because she is our little princess, I was very pleased with the quality of this item. It was well made and not as delicate as I thought it would be, this will last for many years to come. This is very cute and works out well if you have a "Princess" in your family. Would do well for any time of the year - birthday, new baby, etc. My two great granddaughters will love receiving these ornaments for Christmas. This ornament was just too cute! This is beautiful and much better looking in person! I've ordered these for my grand daughters and can't wait to give them as gifts. Twin granddaughters picked this out of catalog and were thrilled with them as they put them on the tree. we get our granddaughters ornaments with the names and the year each year for the Christmas tree from Mamaw & Papaw so when they growup they'll have smething to remember us at Christmas time. My 3 year old granddaughter takes ballet and loved this ornament. It is quite pretty and durable and not cheap at all. She was quite excited about it. Looks like Cillerenda's carriage. Perfect gift for our new Princesses first Christmas!! Breathtaking! It is so beautiful! Buy it and make your daughter smile! I really thought this was a unique gift to my best friends daughter. She loved it as much as I did. I bought this and had it engraved for my granddaughter at Christmas. She loves princesses. This was just like Cinderella's carriage. She loved it. I think this is very nice and will be a nice addition to our granddaughters collection. Bought this for my granddaughter and she felt so special getting this fancy coach with the feathers. I am sure my Granddaughter will throw this ornament out. My niece loves anything princess themed.